Welcome to this week's edition of my Arts 'n' Crafts series. This week I took part in Danielle's hidden Mickey giveaway she was holding on her blog, Underland To Wonderland. You probably recognise her from my last post which she also inspired. 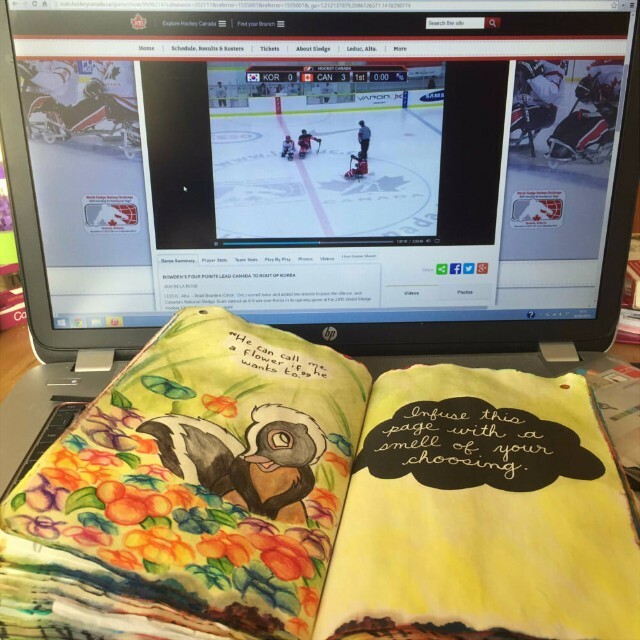 I really loved how her giveaway was different from the norm and I enjoyed taking part. It was also a lucky coincidence it coincided with a week I needed to do something for my Arts 'n' Crafts series! I found out yesterday that my entry won the competition, which makes it all that more exciting to share it with you. Basically the idea behind the competition was to create something or take a photo of something with a hidden Mickey. If you'd like to check out the other entries you can find them in this post. I actually made two entries as I wasn't happy with my first attempt and had time to do something else after Danielle extended the deadline. To be honest, I'm not all that proud of my first go. How I imagined it in my head and how it turned out in reality were completely different. Even though I'm slightly embarrassed by it I figured I would include it nonetheless. 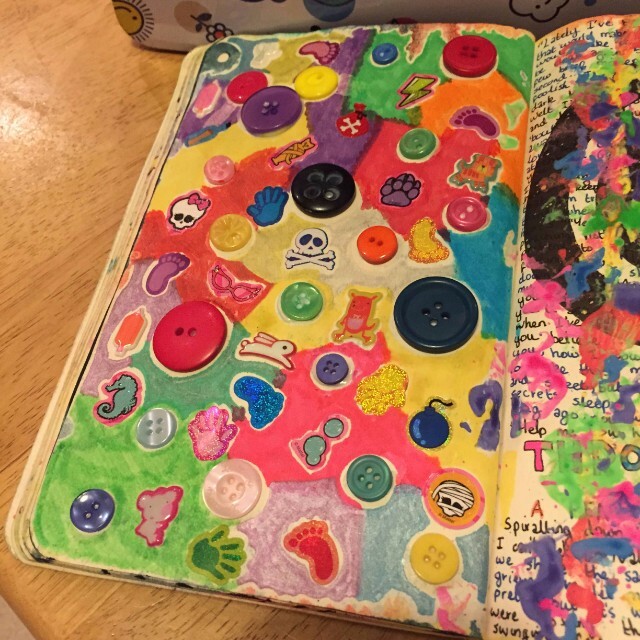 Both entries were done in my Wreck This Journal. 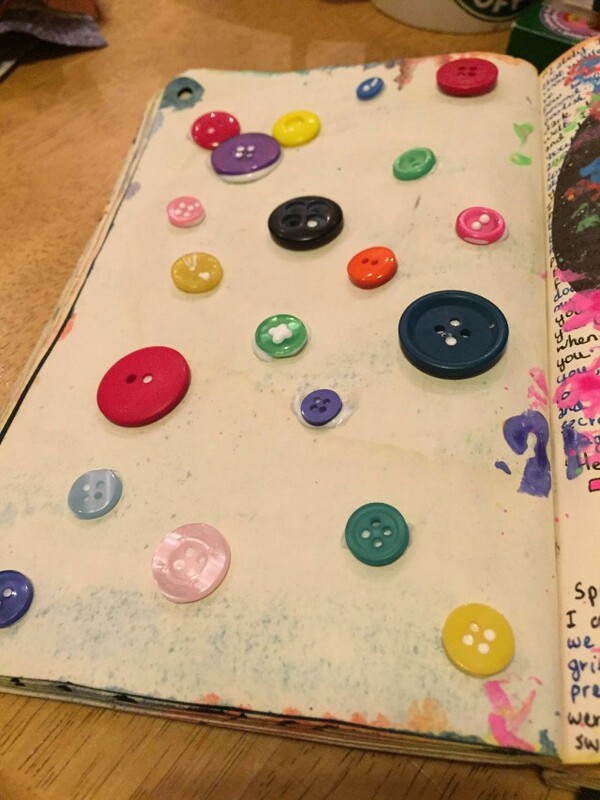 One of my favourite things to use in my art and crafts are buttons. I just think they're cute. I also love stickers, so I figured I would incorporate both. An added explosion of colour made for a pretty juvenile piece of art. Although I didn't particularly like the outcome I had fun creating it. I started by gluing a selection of buttons to the page from my button collection. You can already spot the hidden Mickey! After that I covered the page in stickers before I coloured in around them in a patchwork of different colours using felt tips. Eh, I'm embarrassed showing it but here is the finished product. My second entry was a lot more artistic, if I do say so myself. 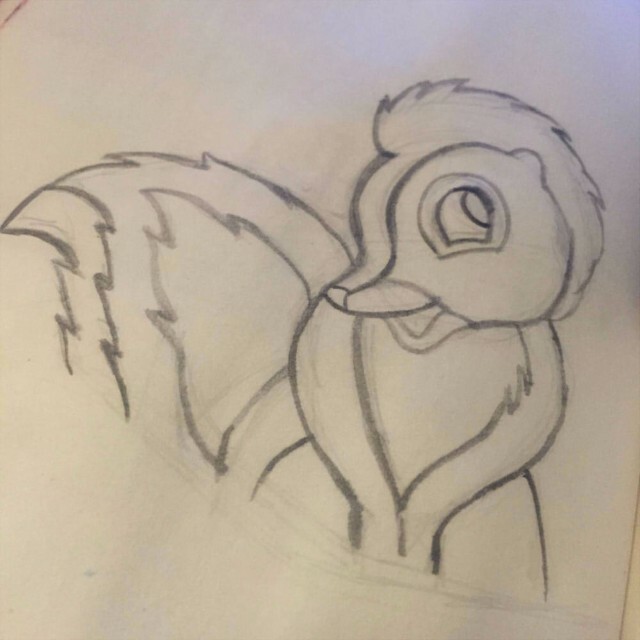 It was inspired by a hidden Mickey picture I seen on Google where the Mickey was in the eye of Bambi. 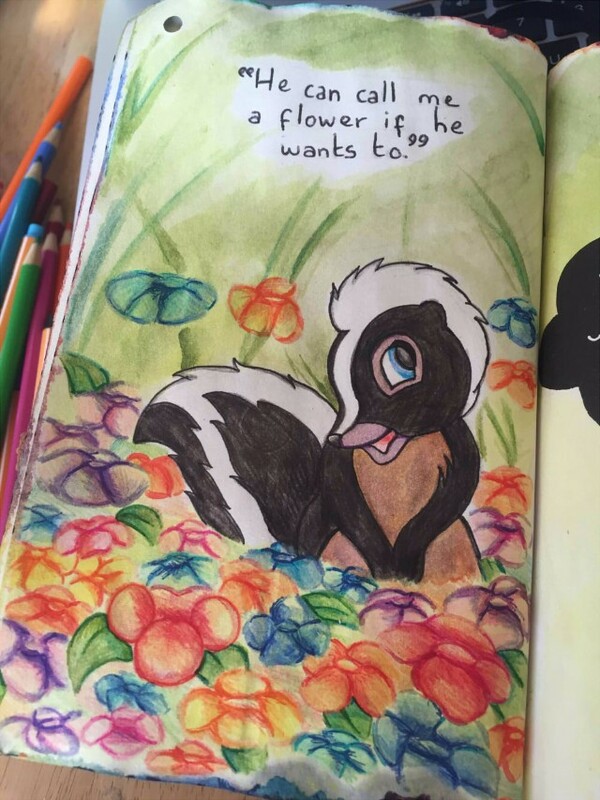 My favourite character from Bambi is Flower and as I flicked through my Wreck This Journal I came across this page. Then it came to me. Flower. Flowers. Smell! I decided to draw my own interpretation of the scene when Flower says "He can call me a flower if he wants to." It's one of my favourite scenes! I used watercolours, colouring pencils and pens. Mixed media has always been my go to with art. Alone I can't use any of them decently, but I seem to get away with combining them. I started by sketching out Flower. I then outlined him and coloured him with watercolours before painting him in. After writing the quote first in pencil and then pen I did a yellow wash at the bottom of the page and green at the top. Once that dried I did the outlines of the flowers freehand with watercolours. I decided to do the hidden Mickey in the flowers instead of Flower's eye because his eye ended up being too small. To colour the flowers in I used a mixture of watercolours and colouring pencils and also went over Flower with the colouring pencils. To finish off I used fine point pens to make flowers stand out a little more and give them definition and shading. I also outlined flower with a black pen. I did all this while catching up on a Ice Sledge Hockey match. Multitasking for the win! Go team Canada! Anyway... this is the finished product and the photo I sent as my competition entry. I'm pretty happy with how it turned out, especially considering how long it's been since I've done this kind of piece. And I'm not trying to make excuses but the Wreck This Journal paper isn't the easiest to watercolour on. Once you lay down a colour it absorbs very fast and it's hard to spread it or pick it up again. That's why the muzzle and chest colours aren't very good. 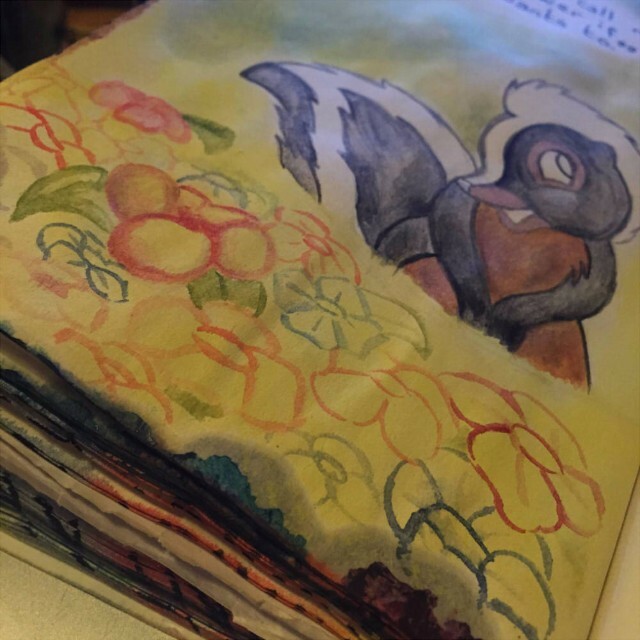 I also plan to cover the other page with the same flowers but I ran out of time to do that before I had to post this. 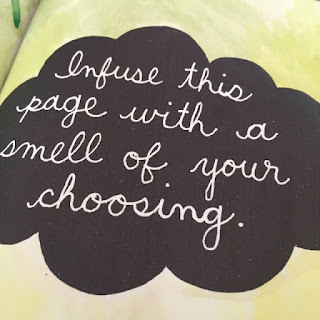 Then I am going to try and infuse the smell of flowers with the page... not skunk. Hope you enjoyed this week's Arts 'n' Crafts post! Have you been up to anything arty or crafty this week? Love this! I really can't tell you how much I love your entry, I want to frame it on my wall haha!! The first shot was really cool too - so different, though if my Mam had of been judging and you'd entered that she'd of been grossed out (she has a phobia of buttons!! LOL). 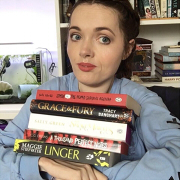 Congratulations on winning Danielle's competition! I loved looking through all of the entries, but I definitely had a soft spot for yours!